Saturday was a little more mellow. Our hike was only about two miles. We went up to Navajo Falls. The pools that used to surround the falls are gone so there wasn't much swimming. But it was pretty. The spray and the wind from the falls were so cold, I couldn't even get that close. This is how I enjoy the falls....brrrrrr: I'm in the sun, it's 100 degrees and I'm still cold! 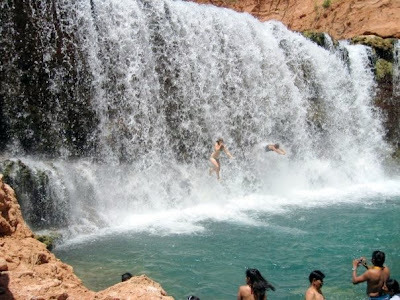 We were stopped for lunch after Navajo Falls, when we saw this guy jumping off Rock Falls. Um...buddy? Didja see the sign?? Never ones to be out-done... Craig, Dan, Chris and Christy all took the plunge. This picture is of Dan. I didn't manage to press the camera button correctly (it's a difficult task, you know) when Christy jumped, so she has no photo of it. Oops. I did this twice. I am scared of water and I wasn't really keen on jumping out of a waterfall, but I hate when people can do things I can't...and really how often do you get the chance to jump through a waterfall?? So, I did it. It was terrible. The weight of the water crashing down from the upper falls is so heavy that it pounds you deep into the pool. I hated it. But I did it again, so I could get a cool picture like this one. I jumped simultaneously with Aimee and Christy. Our timing did not match the photographer's though and there is no picture. But I did manage to land on Aimee and get tangled up with her under water, so it was doubly scary. Nope - not doing that again! We stopped by Havasu Falls on the way home to cool down again. It was really, really hot. I have no pics, but Aimee and Christy were very excited that one of the girls had some biodegradable soap and they were able to bathe! Me? Not so much! Have I mentioned how cold the spray and the wind from waterfalls are? Brrrrr!!! !